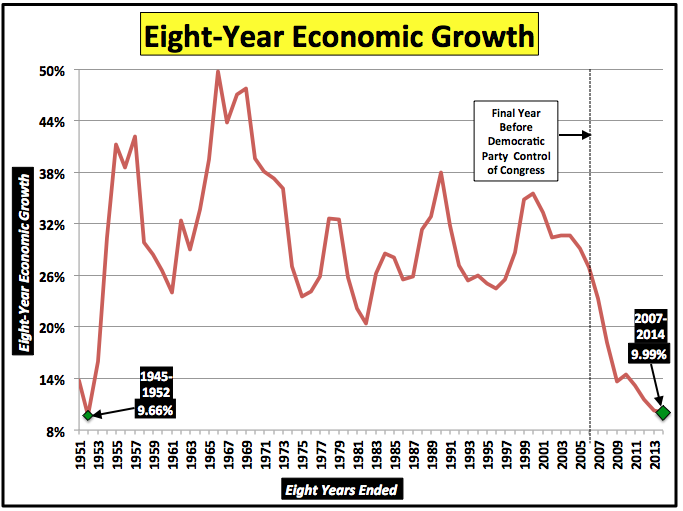 The Pelosi-Obama-Reid (POR) economy continues to wobble badly. A couple of publications have noted that 2014 was the ninth consecutive year during which the U.S. economy grew by less than 3 percent. They're being too kind. Last year was the eighth year in a row of sub-2.5 percent growth, following four straight years (2003-2006) of higher growth. It's hardly a coincidence that the first year of that awful 2007-2014 streak just so happens to have been the same year that the Democratic Party took legislative control in Washington. The nation's political and media elites were quite pleased with themselves when the November 2006 elections brought about that result, largely because their daily hostility to all things Republican and/or conservative contributed mightily to it. They were absolutely ecstatic when Barack Obama, Mr. Perfectly Creased Pants, won the November 2008 presidential election and took office in January 2009. As will be seen shortly, the former event marked the beginning of the U.S. economy's worst eight-year stretch since 1945-1952. Obama's presence in the Oval Office until January 2017 virtually ensures that we'll have at least two more years of the policies which brought on that miserable result. Raising the minimum wage was a key agenda item for new House Speaker Nancy Pelosi and Majority leader Harry Reid after their party took over Congress in 2007. 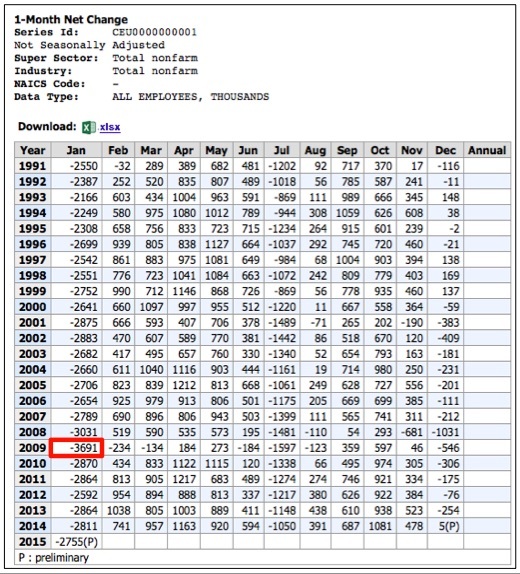 The resulting effects on overall employment have been gruesome, to the point where the people who arbitrarily determine such things have absurdly decided, in the interest of covering their tracks, that the 4.5 percent unemployment rate seen during the middle of the past decade is no longer achievable, and that "full employment" is really a rate of 5.5 percent. The higher minimum federal wage, and the even higher hourly minimums seen in many states and cities, have been especially disastrous for the very people supposedly targeted for help. 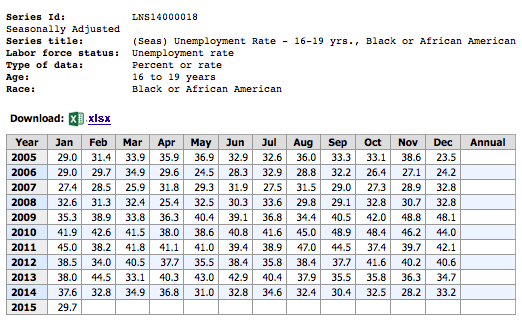 Since the end of 2006, the seasonally adjusted black teen unemployment rate has risen by 5.5 points to 29.7 percent; that rate got perilously close to 50 percent during the recession. 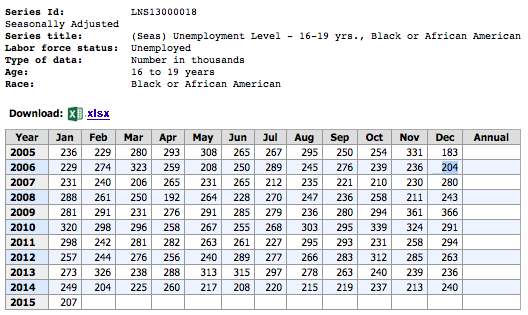 The only reason that the number of unemployed black teens is barely higher now than it was eight years ago is that far fewer of them are even bothering to look for work, and therefore aren't considered part of that statistic. 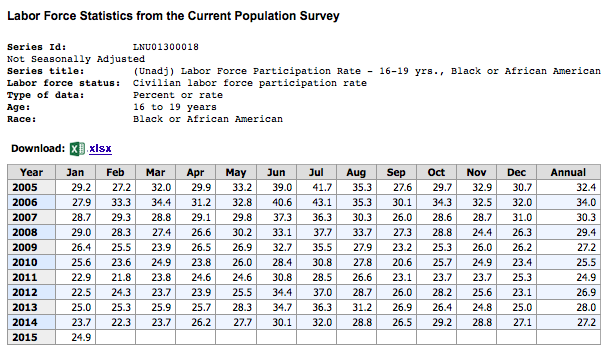 The average black teen labor force participation rate during 2014 of 27.2 percent was 6.8 points lower than that seen eight years earlier; the 2014 average employment-population ratio of 18.2 percent was 5.9 points lower. Not satisfied with the number of job prospects they have already ruined for those who most need their first gainful employment opportunity, President Obama continues to push for a minimum-wage increase to $10.10 per hour, while leftist fever-swamp cities like Seattle are heading towards hourly rates as high as $15. More unemployment and more of the harmful effects of idleness await. Congressional actions hostile to the economy during 2007 and 2008, poorly resisted by President George W. Bush and the Republican congressional minority, were bad enough. After Obama sewed up the Democratic presidential nomination in the spring of 2008, he and his party worsened matters. Their hostility towards developing energy resources and their intent to impose tax and regulatory overkill if elected became readily apparent, sending the economy into a far bigger swoon than the housing bubble alone would have caused. Thus was born the Pelosi-Obama-Reid (POR) economy. In this business climate, are you going to hire more people? Replace employees when they leave? Expand your business? As anyone could have predicted, the answers were "No," "No," and "Heck no." During the presidential transition, Obama let his community organizer mask slip on a few key occasions, inflicting further serious damage. One such incident occurred when he supported union workers illegally occupying a bankrupt company's plant by telling reporters: "They're absolutely right." I wrote at the time that Obama's statement of solidarity "set off alarms in the offices of entrepreneurs, businesspeople, and investors everywhere." In the first full month after the sit-in, the economy shed more jobs than in any other month since such records have been kept. The 1945-1952 result contains four difficult years of transition to peacetime following World War II; two minimum wage increases during that period may also have held the economy back. After that, the economy stayed generally healthy over long-term periods for over 50 years, until 2006. Even someone not conversant with economic policy can recognize that something has gone terribly wrong since then. The already awful 9.99 percent result for 2007-2014 seems destined to drop a bit further. The latest estimates for fourth-quarter economic growth are coming in at an annualized 1.7 percent to 2.0 percent, far lower than the 2.6 percent the government reported in late January. The Obama administration has spent six years passive-aggressively dithering over approving the 1,200-mile Keystone Pipeline — even though the nation currently has 2.6 million miles of oil and gas pipelines in place functioning virtually without incident. Operators of certain legal but politically incorrect businesses have seen their banking relationships terminated by financial institutions intimidated into their decisions by the government's Operation Choke Point. This is a development which one observer correctly noted should be "terrifying to business owners in every industry." The administration has been operating a "shadow immigration system," which during the past six years has issued 5.5 million work permits to non-citizens. 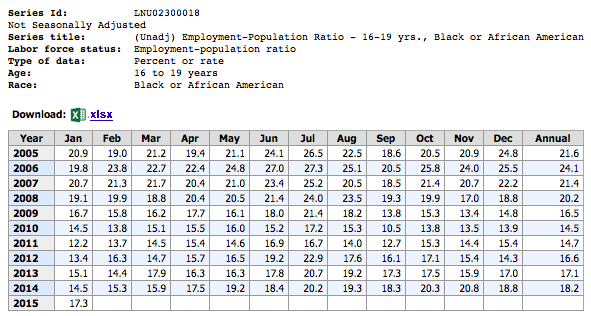 No wonder legal U.S. citizens aren't impressed by the government's reported job-growth numbers. Thus, agenda-driven regulators are deliberately holding up economic progress and bullying existing businesses, while illegal competition undercuts citizens who want jobs. It's utterly amazing that the U.S. economy is growing at all. Given a recent report that "fewer native-born Americans are working today than were at the end of 2007," perhaps the "U.S. citizen economy" really hasn't. Madnesses such as those just described, and so many others, will continue as long as Congress is unwilling to fully exercise its power of the purse. Unless we see a miraculous change in outlook, that's not going to happen. Prepare for two more very rough years.